Just like any computer aided process, out thinking the required steps can be very challenging indeed. If you figure out the stabilizer correctly, then the thread may be acting up. If those are working correctly, the design may not be exactly perfect. If everything so far is working - well you know what I mean. I keep a list of tips and tricks that I find are necessary to help my recall. Hmmm it may not be my recall, it could be my forgetfulness that is a culprit. I have a notebook full of things and trying to keep them organized is a full time job in itself. I do keep some of my best/most needed hints right at hand and I am happy that I have them. 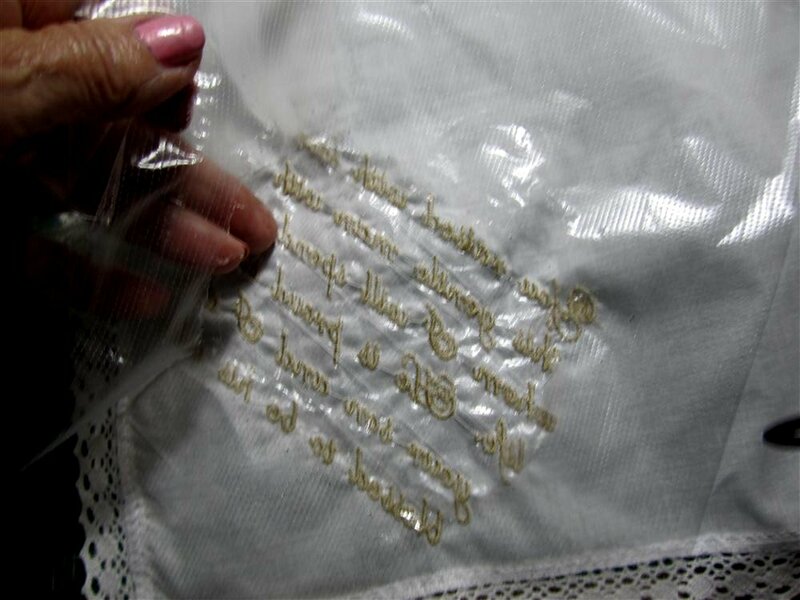 You know, if you read my projects regularly, that I have a website that sells embroidered bridal items. I have been seeing a significant increase in sales and gleefully say that the rest of the world may think the sky is falling, but two young people in love still believe in happily ever after. God Bless Them! Contrary to what you may hear in the way of statistics, they are still getting married and starting families with hope and excitement. We who may be a little jaded could take a cue from that. to protect and care for me. here on my special day. Doing those hankies has been a real challenge for a number of reasons; the most important to me is to have a finished project that is "Wedding Ready." A bride wants to have the best for her special day and I agree that she should have the finest I can provide. Getting to that finished project was more interesting than I expected. After all, just fill in a few words, finish with "Love, Suzie (next line) January 31, 2020." Right? Well, not really. First you must consider your fonts that you will be using for your items. As you know, I really like the fonts in AlphabetXpress which is the pride of the company here at AnnTheGran. 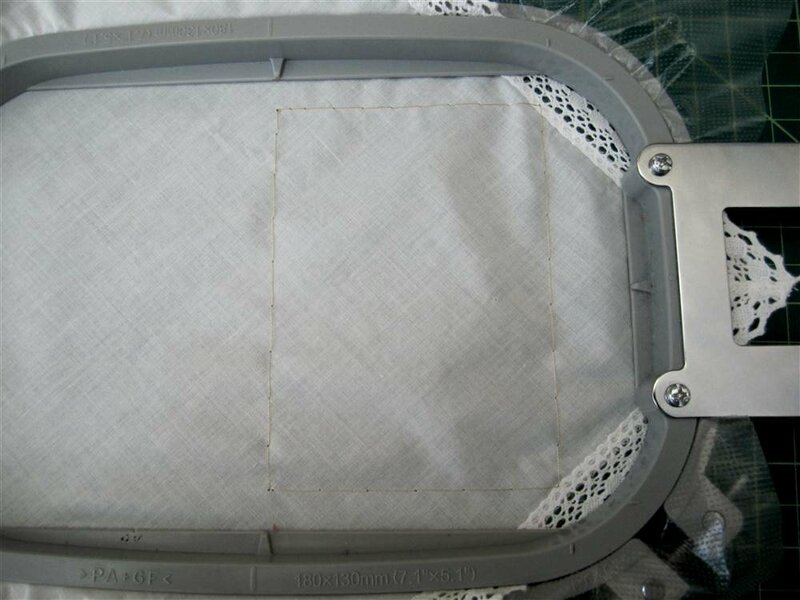 You may not know that it was among the very first of its kind in the embroidery field. It has lead the way to beautiful fonts all of the time. Please do read my experience between my expensive (but aren't they all) machine and AlphaX in this blog. I was really surprised that my machine did not do a better job of lettering than it did. Additionally, I would have to input the words one line at a time which is really time consuming if I used the machine. With AlphaX, all you have to do it type. . . . Even I can do that. Keep in mind that the fewer words the better. 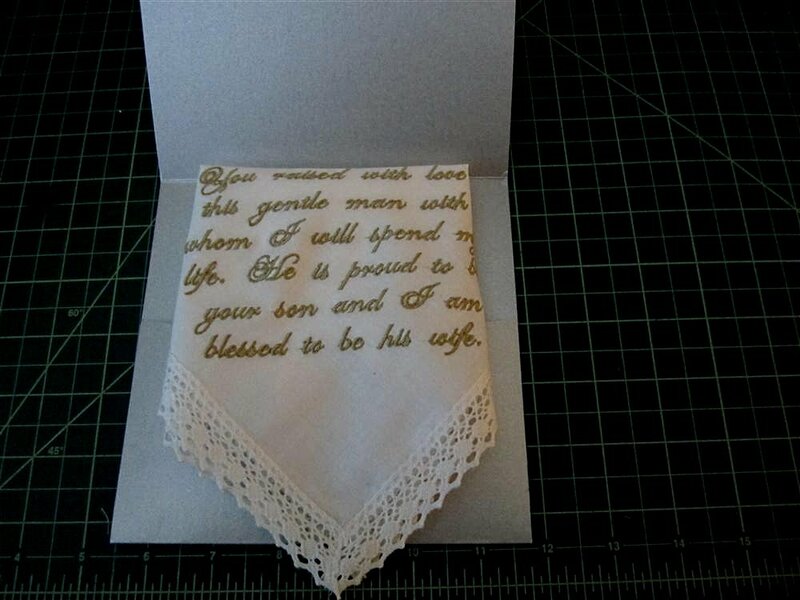 If you have a bride wanting to put a novel on her hankie, I discourage her. It takes too much of my time and less is really more when thanking others. I also use a 'quick type' software called Direct Access (DA). What DA does is called 'macros' or creating a small program that I instruct it to do typing for me. For instance, once I type something on my pc and if I know I will use it again and again, I simply tell DA what letters I want to use and DA will do the rest. An example is if I wanted to give you a URL to one of my older blogs, I would input the address into DA (like the address for AlphabetXpress) and give it a short name (which is alphax) and when I type 'alphax' the computer puts in the correct URL for that site. So instead of remembering that address, I just remember the code for it and I can give that URL 100 times a day without looking it up. I do the same for whole paragraphs and pages of information. The thought for the stepparent shown earlier is coded so I don't have to remember the worded AND I know that there are no typos or mistakes because I use it all the time as is. It is a big time saver for me! Back to the hankie. My most frequently requested font is Darling. Darling is about the most versatile font I have ever found. It is clean (no unnecessary swirls), easy to read (some are not!) and looks like handwriting. 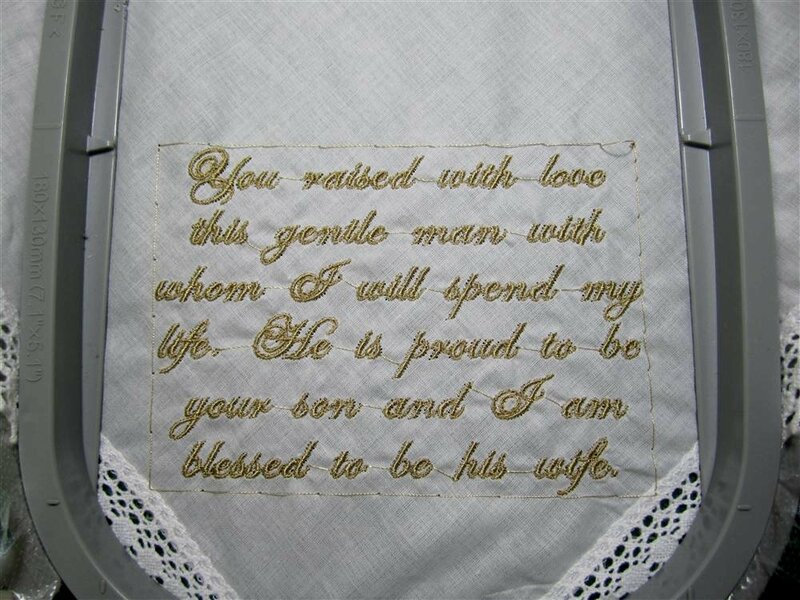 This is a sample of Darling for a bride to her mother and my second most sold thought. 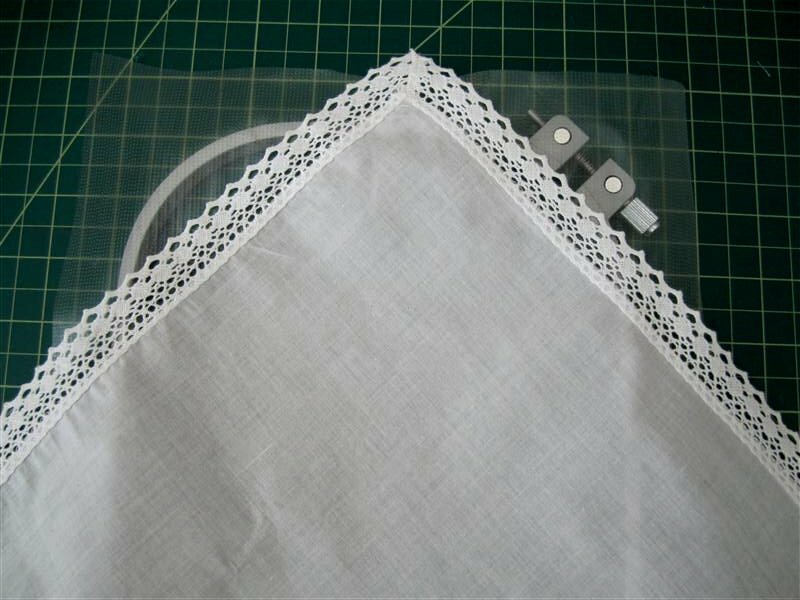 Here are the details of how I create a hankie that is Wedding Ready! First I always use Heat Away stabilizer. You may ask why I don't use a water soluble and that is logical, but I seek the best product for the best results with the least amount of work for me. Water soluble is more work that heat away and time is money. Just an FYI, I also use Hugo's Tape to hold the opened roll of stabilizer. It is clear and sticks to itself. I wrap it around the stabilizer and mark the name and end of it with a black permanent marker. 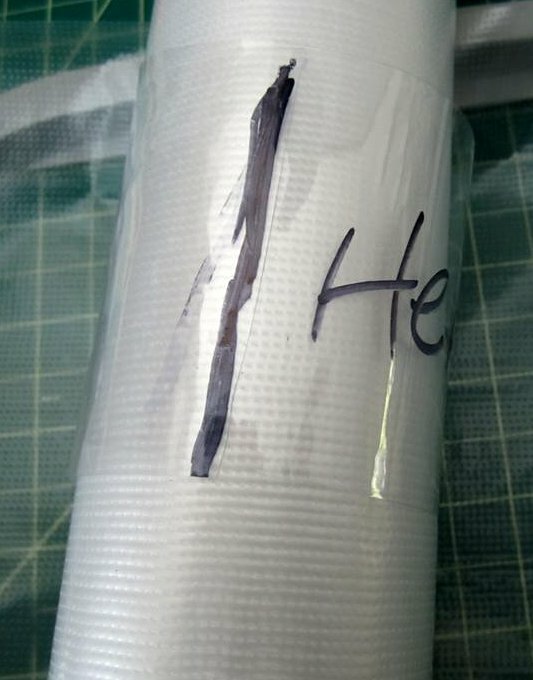 I know which stabilizer I am working with and it is easy to remove the tape, it does NOT leave any sort of mark of any kind. And, Hugo's Amazing Tape (I agree with the name, it is Amazing) is used for hundreds of other things including wrapping all sorts of moving items without leaving any marks, keeps items clean (cover item), holds very snugly and you will find so many uses around the house. You get a large roll and a very small one for bobbins. You will LOVE it! Using my 'self-healing' mat, I align my hoop, then my stabilizer, then my hankie. It sounds like a lot, but getting wording on straight on a corner is important to the success of my project. These mats may be for quilters, but I use mine daily without fail. It is my work area and it helps me keep the area clean. If the mat is not clear, my sewing area is a mess. 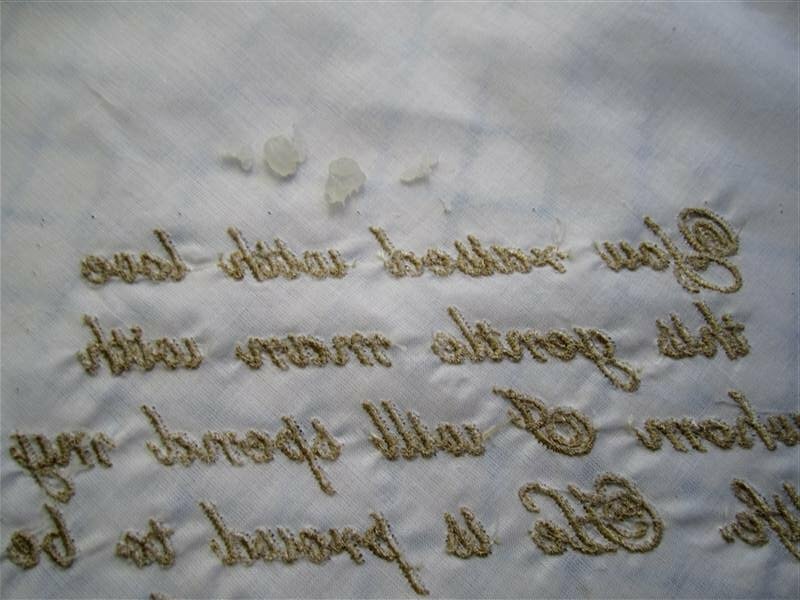 I always do a baste stitch around my words for two reasons, #1, it shows me that I am centered, or not, on the hankie. Secondly, it holds the hankie down to the stabilizer without the use of adhesives. If you want to put some glue on, spray it on the stabilizer. Another hint is to keep your wording width to as little as 5" or 12.5cm. If you don't, you will need to use a larger hoop and there is no advantage to doing that. It just costs you more money for a larger piece of stabilizer without adding any value to the project. Then I sew out my wording. It is important to remember that a well digitized font (AlphabetXpress!) 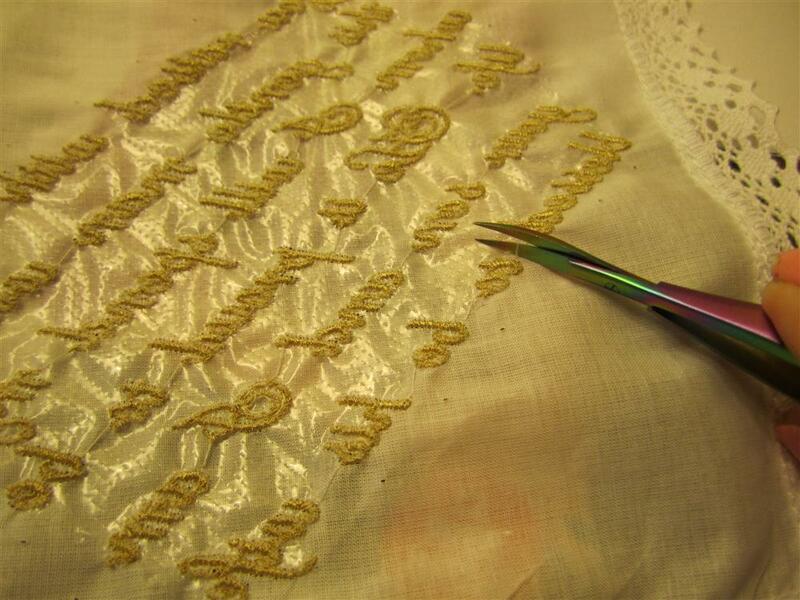 will have a stop point (a couple of tack-down stitches) at the end of a letter and the beginning of the next letter. That is really important and NOT all fonts have this feature. I take one last look at my project while it is still in the hoop. Occasionally there will be a spot that needs to be redone and if you don't catch it now, you may have a ruined project. If needed, I will start with the back of the words to remove stitches and only use my tweezers on the front. 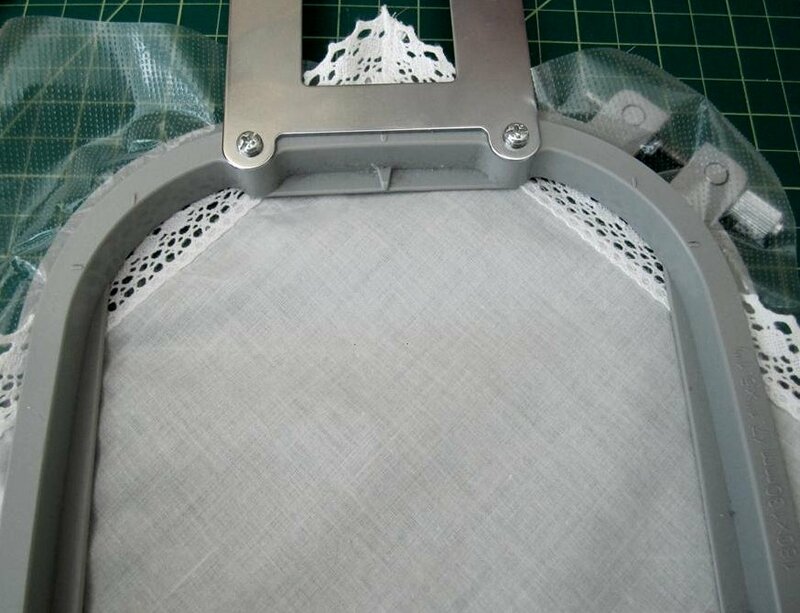 This helps to avoid cutting your fabric because the stabilizer is still in place. Next, I remove the baste stitching. I do start on the back and clip the 4 corners and remove the thread. The top thread will then be only laying on the fabric. Remove as much of the stabilizer as is practical. Be careful not to damage the stitching. 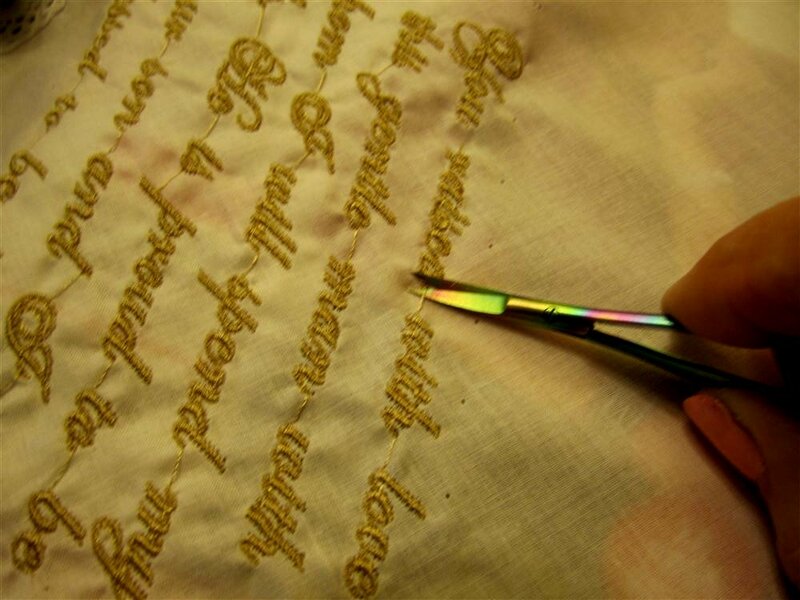 BUT, to start removing the jump stitches between words and some letters, you MUST start on the front. Carefully remove the jump from right to left or vice versa as you please. I leave about 1mm on each side to keep the letters in place. I have ruined projects by cutting the back first and on both sides of the jump on the back as well as the front. 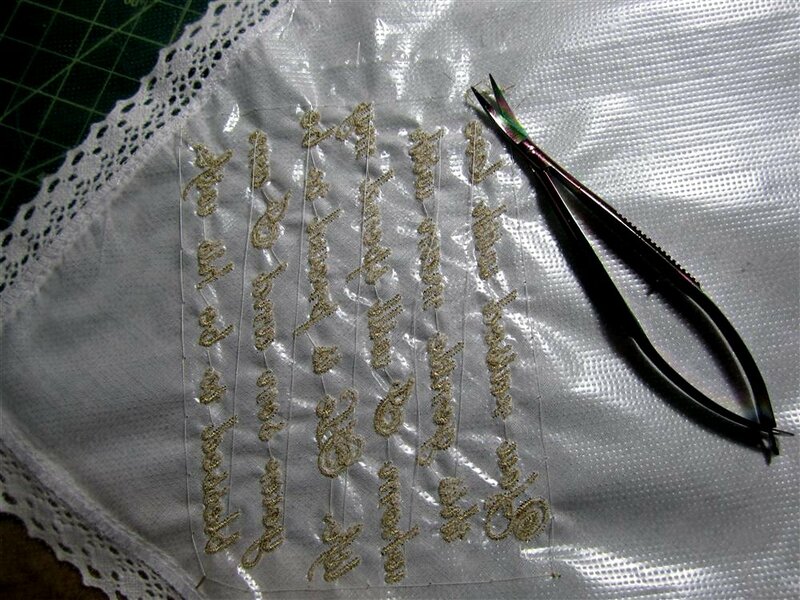 That is a big mistake because a letter can unstitch with this method. First, cut the jumps on the front using two cuts. After all the jumps are done, do a single cut in the middle of the jump on the back. Doing so will assure that your stitching will stay put. When you are cutting, you will see and/or feel the fabric relaxing. That will eliminate most of the puckering you may experience from the letters. Don't forget to carefully cut the 'i' and that is really a tender spot! 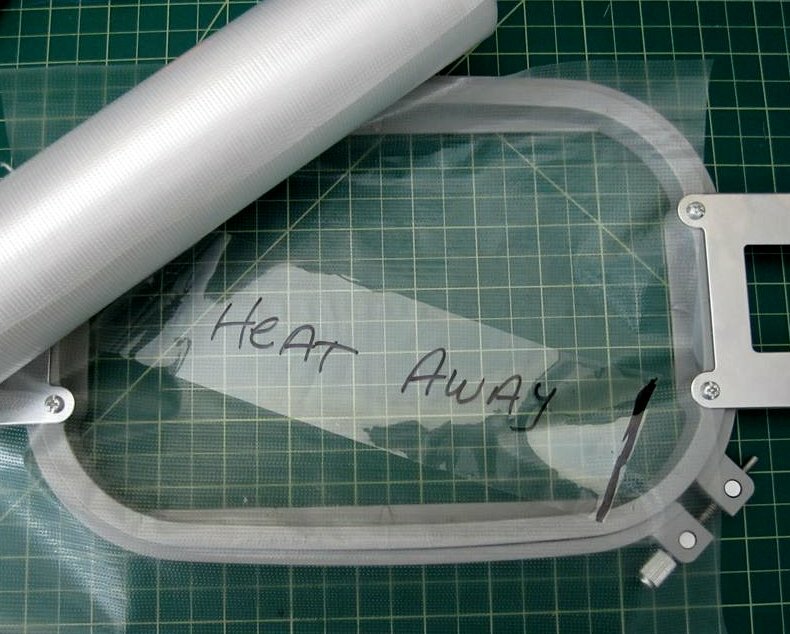 You will make two cuts on the front and a single on the back and since there is so little room to work, this should be done with excellent lighting and very precisely. 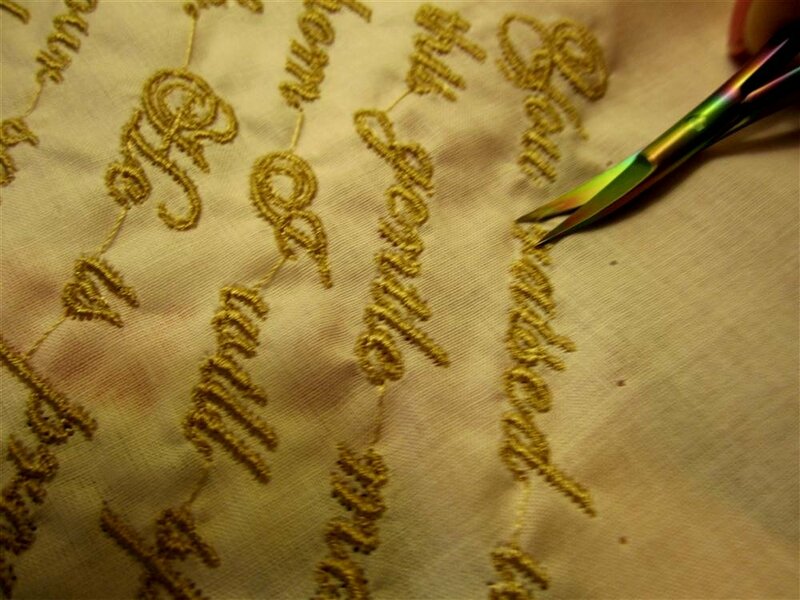 Making the letters look good are the job of both the digitizer and the embroiderer. AlphabetXpress does a great job with this task. After all cuts are make, I hold up the hankie to a good light to see if there is anything hanging around that I want to remove. I also lay it flat on a clipboard and look at it as if it were the horizon. You may see things you did not see before and make adjustments at this time. Next, making sure you have turned off your steam on your iron, dry iron the heat away according to the manufacturer's suggestions. At first you will feel like you are ruining the hankie, the iron or both. However, you will get some very small plastic balls that you merely need wipe away to a trash receptacle. We are nearly done. . . .
Lastly, and this is one of those delightful moments that I love, using a spray of Mary Ellen's Best Press tops the hankie off beautifully! It gives your hankie the look of being pressed at the dry cleaners. If you love that crisp look, the Best Press is something you will use for many things. It is beautiful on your heirloom linens, cotton shirts and anything you want to look especially nice. It is excellent! 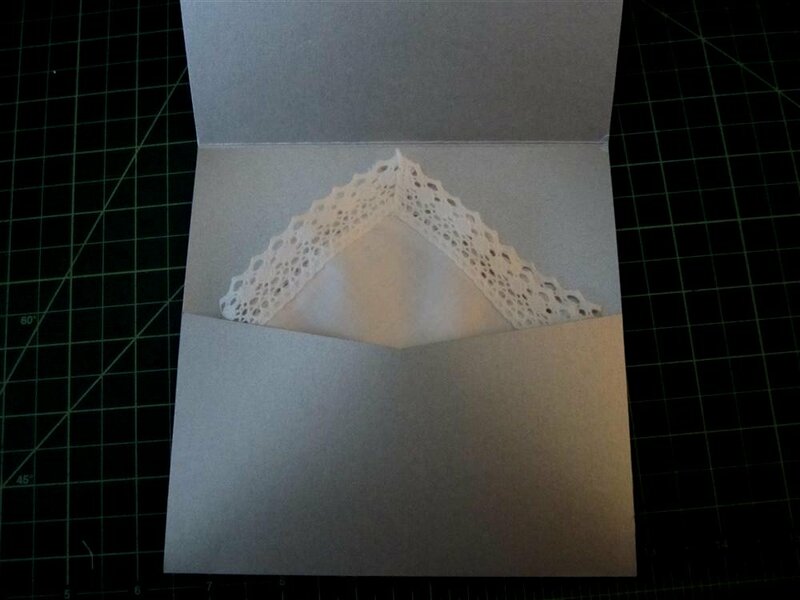 I place my project into my wedding envelopes and it is sent off for the bride to give without any further tasks for her to do. I like to put it in upside down so when you take it out, there is a surprise! It is really Wedding Ready and the Devil does his dirty work somewhere else. You can see that the details of this hankie are demanding whereas a tote or t-shirt embroidery is a little more forgiving. But, I love doing this and feel great satisfaction from a beautiful job well done. Very helpful and well explained...thank you very much. I loved the poems . very pretty gift's. Thank you. I do hankies for some of the older ladies at the retirement home. Hopefully I will be able to buy the heat away here in Durban, South Africa. It seems to be the answer. Susie. Thank you for all the comments. I use the heat away to save time for my business. You can also use the water soluble if that is all that is available. However, embroidery is changing so fast and new items are coming on the market all the time. Watch for it, it is a real time and labor saver. Bless you for doing hankies for those ladies. I wish cotton hankies would make a come back, tissues are fine when you have something that is spreadable, but a cotton tissue is best for a million reasons. Where can I buy that beautiful font DARLING and can it be used with AlphabetXpress? AlphabetXpress is an excellent and well priced - font creator! I appreciate your detailed instructions plus the photos of how you did things. Last Sunday we had a Baptism and I made 50 Linen/Cotton Blend Napkins for everybody invited. My Sewing Store told me "not to wash the fabric first, because they would only be used once. The other store partner told me to use Aqua Magic as a stabilizer and I would not have the hassle of using the tear away, and distorting the emb. on the napkins. Because of the aqua magic, when they were finished and serged around the 4 sides, I then threw them in the washer on Gentle and used damp dry in the dryer. 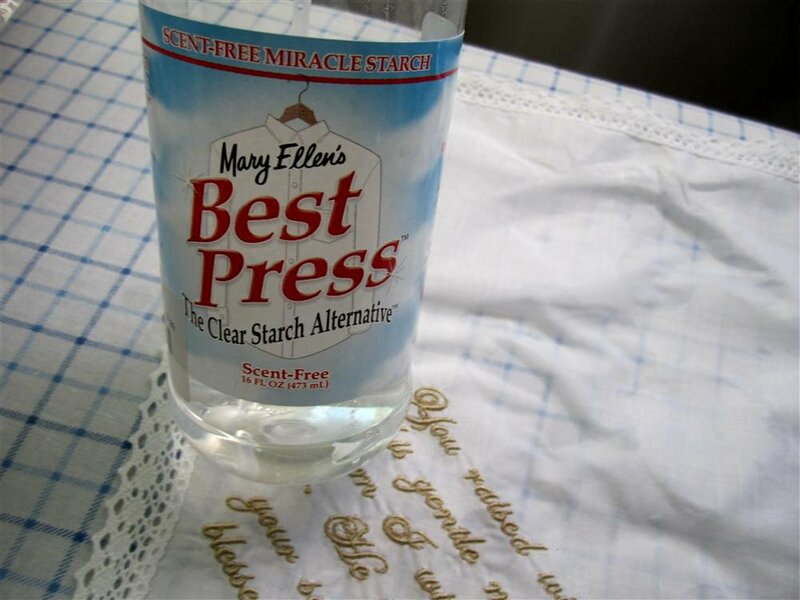 Having being introduced to Mary Ellen's Best Press, I used it as I was ironing dry all 50 napkins They looked 'store bought' when I was finished and me being the godmother of the baby;s mom, I then threw in a small bottle of it for the mother to use when the party was over. I got a call the next day from the new grandmother and she told me that they were very impressed with how all the stains came out and then ironed with the Best Press. Oh yes, I went to another store and bought a plastic wove basket and then made a wrap in muslin, about 36" Sq. which I put in the basket with the 4 corners embroidered with 'Soiled " in 2 corners and 'Go Green" on the other 2 corners. It is from 'Show and Tell' that feed my appetite for embroidery. Having being taught in the ole school, I really appreciate all the help that I gleen from everybody. Thank you so much Mary for your input. I love hearing that others are successful and how they handled the situation. I don't know if I want to iron 50 napkins! That is why I switched from a water soluble to heat away. I still have to iron, but not from a damp item. Great idea about the basket!! !